1. Put the pearl barley and 75g of the oats in a large bowl. Cover with the oat drink and 500ml cold water and soak overnight in the fridge. 2. Preheat the oven to 190°C, gas mark 5. Put the plums in an ovenproof dish and stir in the orange zest and juice. Roast for 30 minutes until the plums are soft and syrupy. 3. Spread the remaining 25g oats and the pumpkin seeds on a baking sheet and pop into the oven alongside the plums. Roast for 5-10 minutes until golden. 4. Meanwhile, tip the soaked barley and oats into a pan, add the vanilla, bring to the boil and simmer for 15 minutes, stirring regularly, until soft and thickened. 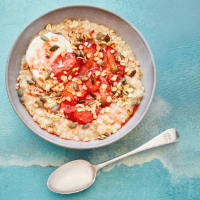 Divide between 4 bowls and top with the plums, yogurt and toasted seeds and oats. You can roast the plums ahead and store in the fridge for up to 3 days. This recipe was first published in Tue Sep 04 16:48:22 BST 2018.